In a move that will create America’s largest organization working for a more open, accessible, and inclusive Jewish community for gay, lesbian, bisexual, and transgender (GLBT) Jews and their family, friends, and allies, Keshet and Jewish Mosaic: The National Center for Sexual and Gender Diversity and have agreed to merge. 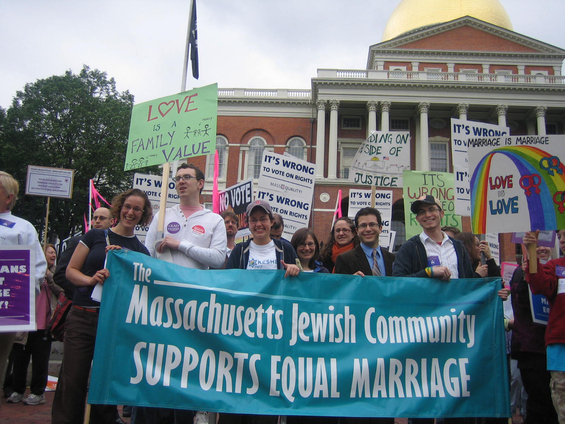 Keshet, headquartered in Boston, is a leader in education, training, and grassroots organizing for GLBT inclusion in the Jewish community. Keshet is also well known for its groundbreaking documentary film, Hineini: Coming Out in a Jewish High School, called a “terrific teaching tool” by Variety Magazine. Jewish Mosaic: The National Center for Sexual and Gender Diversity, a managed project of Jewish Funds for Justice, is a leader in Jewish institutional change, community-based research, and resources on GLBT Jews. The Denver- and San Francisco-based Jewish Mosaic recently released Torah Queeries: Weekly Commentaries on the Hebrew Bible (NYU Press, 2009), an innovative examination of Biblical texts described as a “must for the Jewish bookshelf” in the Jerusalem Post. Both organizations have repeatedly been recognized as among the “most creative and effective Jewish organizations” in North America by Slingshot: A Resource for Jewish Innovation. The two organizations have worked closely together and are currently partnering with Nehirim, another GLBT Jewish nonprofit, on a major national convening of Jewish GLBT leaders. Over the past year, Keshet and Jewish Mosaic had been in discussions about how they could be more effective and have the greatest impact in the Jewish community. “Our organizations share a vision of a Jewish community that lives up to its highest values, and with our complementary skills and methodologies, together we can get there,” noted Idit Klein, Executive Director of Keshet. “By joining forces, we become a stronger voice for inclusive communities than we could ever be working alone,” said Gregg Drinkwater, Executive Director of Jewish Mosaic. The combined organization will retain the name Keshet pending a comprehensive strategic review to enhance the impact of its integrated research, education, organizing, and advocacy efforts. Klein will be the Executive Director; Drinkwater will become Deputy Director and oversee the new Research and Publications Department. The headquarters of the organization will be in Boston, with an additional office in Denver and a staff presence in the San Francisco Bay Area. The combined organization also will retain Keshet’s corporate identity and 501(c)(3) tax-exempt status. The Chair of the Board of Directors will be current Keshet board chair Stuart S. Kurlander. Dr. David Shneer, who co-founded Jewish Mosaic with Dr. Caryn Aviv in 2003, will be Vice Chair of the Board. Over the next few months, the organizations will further integrate their lay leadership and elect additional Board members. “Bringing these two important and strong organizations together will significantly advance the movement for GLBT inclusion in the Jewish community,” said Kurlander. The new Keshet will put Jewish values and learning in service of the transformation of the entire Jewish community. “To paraphrase Martin Luther King, Jr., the destiny and freedom of all Jews is bound up in the destiny and freedom of GLBT Jews; the dignity of one is the dignity of all,” said Jewish Mosaic Advisory Board Chair Shawn Landres, who will also be joining the Keshet Board. Support for the merger has been provided through grants from the Charles and Lynn Schusterman Family Foundation and The Natan Fund. Dr. Michela M. Perrone of MMP Associates provided strategic consulting.